1.3 Time Origins, Censoring, and Truncation. 1.4 Estimation of the Survivor Function. 1.5 Comparison of Survival Curves. 1.6 Generalizations to Accommodate Delayed Entry. 2.2 Some Continuous Parametric Failure Time Models. 2.4 Discrete Failure Time Models. 3. Inference in Parametric Models and Related Topics. 3.3 Censored Samples from an Exponential Distribution. 3.6 Estimation in Log-Linear Regression Models. 3.7 Illustrations in More Complex Data Sets. 3.8 Discrimination Among Parametric Models. 3.9 Inference with Interval Censoring. 4. Relative Risk (Cox) Regression Models. 4.3 Estimation of the Baseline Hazard or Survivor Function. 4.7 Related Topics on the Cox Model. 4.8 Sampling from Discrete Models. 5. Counting Processes and Asymptotic Theory. 5.2 Counting Processes and Intensity Functions. 5.5 Martingale Central Limit Theorem. 5.6 Asymptotics Associated with Chapter 1. 5.7 Asymptotic Results for the Cox Model. 5.8 Asymptotic Results for Parametric Models. 5.9 Efficiency of the Cox Model Estimator. 6. Likelihood Construction and Further Results. 6.2 Likelihood Construction in Parametric Models. 6.3 Time-Dependent Covariates and Further Remarks on Likelihood Construction. 6.4 Time Dependence in the Relative Risk Model. 6.6 Residuals and Model Checking for the Cox Model. 7. Rank Regression and the Accelerated Failure Time Model. 7.3 Development and Properties of Linear Rank Tests. 7.4 Estimation in the Accelerated Failure Time Model. 7.5 Some Related Regression Models. 8. Competing Risks and Multistate Models. 9. Modeling and Analysis of Recurrent Event Data. 9.2 Intensity Processes for Recurrent Events. 9.3 Overall Intensity Process Modeling and Estimation. 9.4 Mean Process Modeling and Estimation. 9.5 Conditioning on Aspects of the Counting Process History. 10. 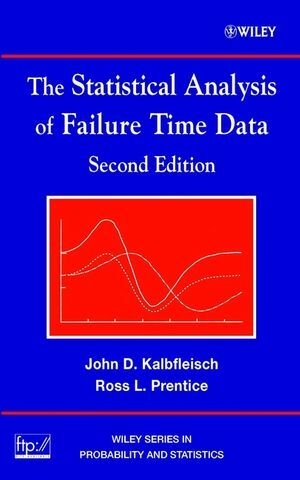 Analysis of Correlated Failure Time Data. 10.2 Regression Models for Correlated Failure Time Data. 10.3 Representation and Estimation of the Bivariate Survivor Function. 10.5 Illustration: Australian Twin Data. 10.6 Approaches to Nonparametric Estimation of the Bivariate Survivor Function. 10.7 Survivor Function Estimation in Higher Dimensions. 11. Additional Failure Time Data Topics. 11.2 Stratified Bivariate Failure Time Analysis. 11.3 Fixed Study Period Survival Studies. 11.4 Cohort Sampling and Case-Control Studies. 11.7 Sequential Testing with Failure Time Endpoints. 11.8 Bayesian Analysis of the Proportional Hazards Model. 11.9 Some Analyses of a Particular Data Set. Appendix A: Some Sets of Data. Appendix B: Supporting Technical Material.